Democrat Tom Daly currently represents Assembly District 69 and will not be termed out until 2024. Daly is expected to easily win re-election in 2016. Tom Daly was elected in November of 2012 to represent California's 69th Assembly District, which includes the cities of Santa Ana, Anaheim, Garden Grove, and Orange. 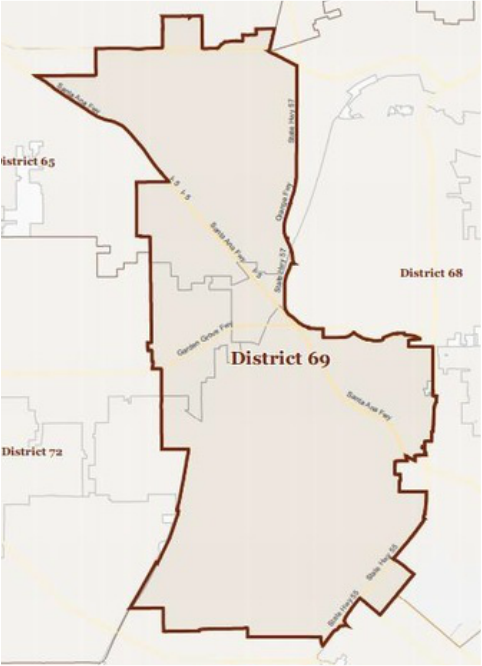 Daly was born and raised in the 69th District. He first sought elective office in 1986, winning election to the Board of Trustees of the Anaheim Union High School District. Since that victory, Daly has won eight consecutive elections, including serving as Mayor of Anaheim from 1992-2002 and Orange County Clerk-Recorder from 2002-2012. As Mayor of Anaheim, Daly oversaw major public and private investments in the City, including the expansion of the Resort Area, leading to the creation of thousands of jobs. At the same time, Daly also served on the Board of Directors of the Orange County Transportation Authority, where he helped oversee a $3 billion dollar improvement program for road and transit projects in every community in Orange County. Later, as the elected countywide Clerk-Recorder, Daly opened two branch offices for the convenience of the public, saving the office's customers over one million miles of driving every year. In the State Legislature, Assemblymember Daly is focused on ensuring a balanced budget with a healthy reserve, maintaining and improving our statewide infrastructure and reducing bureaucratic red tape while promoting government efficiency. Daly has three children and resides in Anaheim with his wife, Debbie.